What are you most excited about this summer at the symposium? I’m excited about (my) Year Two, and I’m trying to build on what I experienced last year to give the kids an even better experience this year. The second time around is about bringing a greater depth of knowledge, and I’m helping organize the drum set track on top of doing the wind ensemble thing again. Getting to have a little bit more assistance with guiding what the experience will be for the drum set players that come to the camp is really exciting. Right now we’re working on grabbing and collecting the best drum set clinicians we can find, and curating the experience over a three-day period. So rather than having it be a back-to-back wave of clinics, the students have more hands on time to apply the ideas, and that the clinicians themselves are structuring their clinics to operate over a three-day period of growth. The students are presented with ideas on Day One that end up being developed throughout the three days of the camp. I’m a coffee person, but it would have to be cold brew. I’m not really a hot coffee person. Band or Artist that has caught your attention this year? In my search for new music I end up falling back in love with old music, but I hear it differently. If I revisit stuff like Stravinsky, or Holst’s The Planets, things click. I always find the inspiring elements that I need to hear in the works of the old masters. There’s a lot of trends in new music right now; a lot of flavors and people experimenting, or trying to reinvent. But I think there’s value in revisiting the music that has lasted the test of time; that still sounds fresh when you hear it hundreds of years later and then figuring out what makes that music work. It’s not a production trick. It’s not anything else. But when you sit down on the piano and play the most basic reduction of Debussy, you can’t help but ask: What makes it timeless? It’s still sort of this unlockable mystery. Any session highlights you can give us before the symposium? I remember what it was like as a kid going to clinics. Just getting overloaded with information and it was awesome. But then you never got to go into the practice room and tryout what you just learned. Naturally, one of the things I wanted to do was make sure that the kids are given an opportunity within the timespan of the clinic to go practice, shed, and hang out with the other drum set players. Give them an immersive playing environment versus just having them experience all these incredible clinicians. By having them be able to provide feedback to the students on a project, an idea, or a concept to work on, and then be able to see those students the next day is such a rare thing. Anywhere between 6 AM and 7 AM. If I’m on it, I go work out. If I’m not on it, I’m answering e-mails, making breakfast and start working for the day. No, not really. Just get stuff done I suppose. I work from home predominantly; especially in the summer. I’m just writing in the studio all day. And then I go to Chino Hills once or twice a week depending on what time of the year we’re at. It’s shocking how far along I’ve made it in adulthood and I don’t have an e-mail strategy. It’s really just trial by fire. It’s the truth. I’ve definitely put the majority of my mental energy into the creative aspects and not so much into the organizational aspects of my life. I’m trying to write something better than I wrote yesterday. Having to create every single day no matter what. If you had to describe something that is definitely "you" that is present in all your creations, what would it be? I bring my experiences, variety, and musical backgrounds to everything I write. So my experience as a rhythm section player and my love for both Romantic era music and contemporary pop and R&B is always present in everything I do. 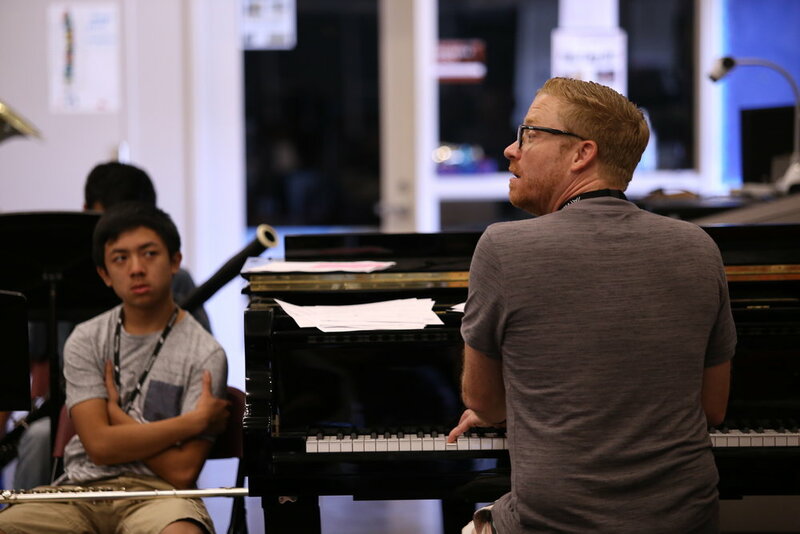 He is a composer and educator based out of Southern California. Ian received his Bachelor of Music in Percussion Performance from California State University Long Beach, where he specialized in drum set, marimba and composition. He currently teaches, designs, and composes for the Chino Hills HS percussion ensemble and has been there since 2010. He also instructed Pacifica HS from 2006-2011 and Los Alamitos HS from 2005 – 2011. In the summer of 2009, Ian was brought on as the electronics consultant/arranger with the world famous Cadets Drum and Bugle Corps and worked there from 2009 to 2012. Ian joined the design team for the Blue Stars Drum & Bugle Corps as the front ensemble and Co-Brass arranger from 2013-2016. He also composes original marching band shows for several HS programs around the country. Ian is a Signature Vic Firth artist, a Yamaha artist, a Remo artist, a Zildjian artist and a WGI Percussion Advisory Board member. In the summer of 2008, he launched Box-Six.com, a website compiling original indoor percussion and marching band shows with fellow composer John Mapes. Ian lives in Fullerton, CA. Learn from Ian and many more at the Arcadia Symposium.